Enalapril Maleate is an angiotensin-converting enzyme (ACE) inhibitor, used in the treatment of hypertension, diabetic nephropathy, and chronic heart failure. 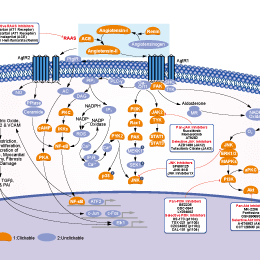 Captopril is an angiotensin-converting enzyme (ACE) inhibitor with IC50 of 6 nM. Lisinopril is an angiotensin-converting enzyme (ACE) inhibitor, used in treatment of hypertension, congestive heart failure, and heart attacks, and also in preventing renal and retinal complications of diabetes. Cilazapril Monohydrate is an angiotensin-converting enzyme (ACE) inhibitor used for the treatment of hypertension and congestive heart failure. Moexipril HCl is a potent orally active nonsulfhydryl angiotensin converting enzyme (ACE) inhibitor, used for the treatment of hypertension and congestive heart failure. Quinapril HCl is the hydrochloride salt of quinapril that is an angiotensin-converting enzyme inhibitor with a Ki of 20 μM. Temocapril HCl is the hydrochloride of Temocapril, which is a long-acting angiotensin-converting enzyme (ACE) inhibitor, used for the treatment of hypertension. Temocapril is a long-acting angiotensin-converting enzyme (ACE) inhibitor, used for the treatment of hypertension. Imidapril HCl is an angiotensin-converting enzyme (ACE) inhibitor with IC50 of 2.6 nM, used for the treatment of hypertension. Fosinopril Sodium is the ester prodrug of an angiotensin-converting enzyme (ACE) inhibitor, used for the treatment of hypertension and some types of chronic heart failure. Fimasartan is a non-peptide angiotensin II receptor antagonist (ARB) with noncompetitive, insurmountable binding with the AT1 receptor. It is used for the treatment of hypertension and heart failure. Irbesartan (SR-47436, BMS-186295) is a highly potent and specific angiotensin II type 1 (AT1) receptor antagonist with IC50 of 1.3 nM. Valsartan is a selective angiotensin II receptor antagonist, used to treat high blood pressure and congestive heart failure. Olmesartan Medoxomil (CS-866) is a selective angiotensin II type 1 (AT(1)) receptor antagonist, used in the treatment of high blood pressure. Candesartan Cilexetil is an angiotensin II receptor antagonist with IC50 of 0.26 nM, used in the treatment of hypertension. Azilsartan is an angiotensin II type 1 (AT1) receptor antagonist with IC50 of 2.6 nM. Eprosartan is a nonpeptide angiotensin II receptor antagonist, [3H]-eprosartan binds to the AT1 receptor with KD of 0.83 nM in rat vascular smooth muscle cells. Benazepril HCl is a novel angiotensin I converting enzyme inhibitor, used primarily in treatment of hypertension.